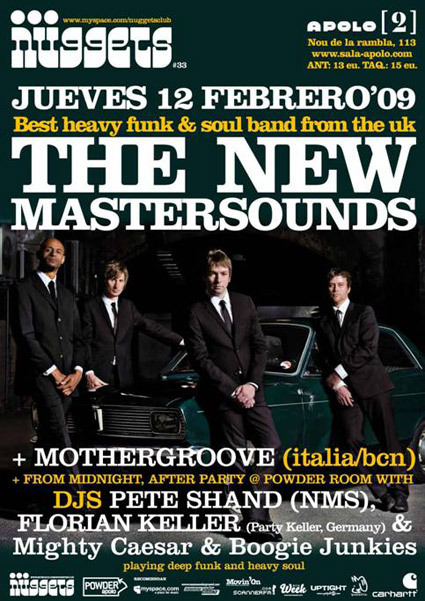 This month the british sensation The New Mastersounds come around to play good old Soul music infected by heavy Funk. Before they enter the stage Mothergroove from Italy and Spain will warm-up Sala Apolo. Later DJs like Florian Keller from munich, Pete Shand, bassist of The New Mastersounds ,and local heroes like Boogie Junkies will throw an all-night party with more deep Funk and Soul rhythms. An organic oldschool night for lovers of handmade breaks and beats.